Remove and discard the giblets and neck of the turkey. Using the Cleaver, cut turkey up into parts. In the Stock Pot, pour 4 liters of water and add turkey, white onion and garlic. Cover and cook at medium-high for 28 minutes, or until valve sounds. Reduce temperature to medium and cook for 10 more minutes. Preheat the Double Griddle at medium-high for 3 minutes. Add tomatoes, husk tomatoes and chiles; grill for 5 minutes on all sides. Blend cooked onions (left in the pot) with 1 cup of the broth, grilled vegetables, green onion, cloves and sweet pepper. Pour this blend back into the pot; add bouillon cubes, annatto powder and breadcrumbs; stir well. Cover and cook at medium heat for 10 minutes. Add mint leaves, cilantro, cinnamon and salt to taste; cover and cook for 10 more minutes. 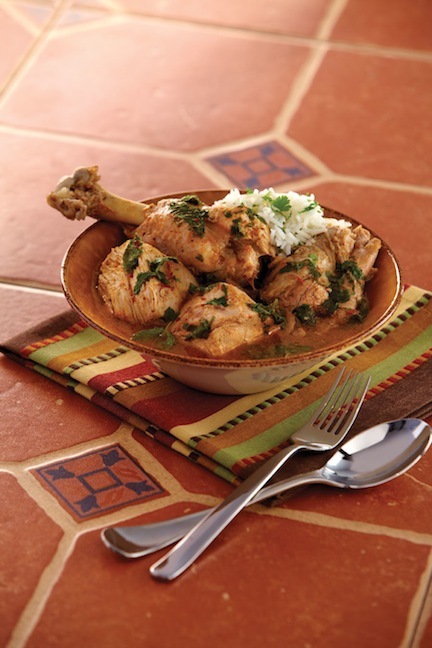 Serve with white rice, chopped cilantro and onion.